when life hands you the poo end of the stick, make poo aide. What did you do on Columbus Day? A: I cut a banana. Some people will undoubtedly have stories about their Columbus Day antics. I have no doubt in my mind that there are stories of naked dancing and making love in the streets. I however, spent the day in the way most responsible citizens in New York did. I cut a banana with a banana slicer. 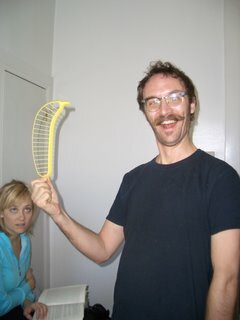 I have no idea where this banana slicer came from. I only know that I made oatmeal and simply stated, "I would like some sliced banana", at which point my roommate Tom brought out an invention I have never before laid my eyes upon. My other roommate Crystal seem unfazed by the events that would take place. Please be warned. Some of the pictures displayed are graphic in nature and content. The banana was remarkable in length. Just look at how it measures up to our hands. Notice the chipped nail polish on my nail. It's time for a manicure. This picture needs no words. Just look at Tom. Just look at Crystal. 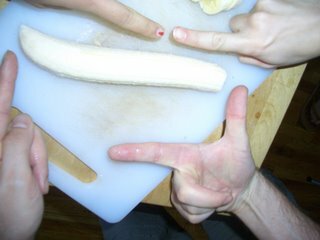 All are marvelling at the banana cutter. How. How does such a thing exist? 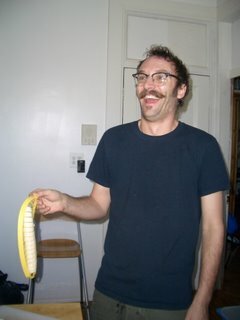 And what will it mean for you and me and all our future experiences with bananas? And knives? And what of babies? What will all the babies do now that this invention has made its way into our lives? The Process: Note the concentration. Not just any old bozo can work the wondrous contraption known as the banana cut master. The slices of banana must be planned so that each portion of the banana is sliced equally. We're talking balance. Crystal takes pause from reading to witness this great event. The deed has been done. The banana has been sliced. The wind blows through the trees leaving a rememberance of days past. A small child cries out for justice.